HIE GUY! Lol.. and so I've appeared again.. but I'll likely be gone again after a while School brings me down a lot. Yes. So, a fewww of you might remember me. Especially those from the old YOT 6 years (?) ago. Anyways, The more I look at the drawing, the more I hate it. Any tips for improvements guys? and yes, imadehimhalfnakedgotaproblem? lol.. and yah I mixed his various costumes together cos I felt like it. Feel free to visit my deviantART website, don't bother visiting my gallery on this site. It's horrible and the drawings in it are really old. Wow, that picture is awesome!!!! I love the hair, and bare upper body!! Great job Digi!! what are you talking about, that was really good. Wow thanks a lot guys! I really appreciate all your comments :3! Digimitsu : Wow thanks a lot guys! I really appreciate all your comments :3! It's a very unique picture of Yoshi and would be cool if Namco made him look more human like. I never thought that a drawing could make me drool XD Great drawing! Never could do that myself. I remember seeing this drawing on deviantART a while ago. I think I might have commented on it. But anyway, Digimitsu, I've seen a lot of your work and I really like it a lot! 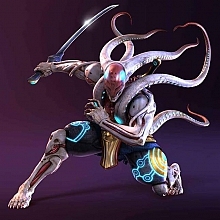 You have a very interesting way of portraying Yoshimitsu in a way only you see him as, and it's a lot of fun to take a peek every now and again. Keep it up. Not so cool for me.